A movie star kidnapped by Communist spies, twin celebrity gossip columnists, a rogue agent disguised as a stud and two delightfully flamboyant musical numbers: These are just a few of the pleasures at hand in Joel and Ethan Coen’s “Hail, Caesar!”, a magnificently stylish old Hollywood throwback that still showcases these filmmakers’ playful trademark. Anchored by a terrific Josh Brolin as gruff 1950’s-era studio “fixer” Eddie Mannix, “Hail, Caesar!” lacks the bite of the Coens’ darkest comedies and the bizarro vision of the film industry of “Barton Fink,” but offers a lighter access point to those same attributes. It’s a charming consolidation of their appeal that both celebrates and mocks its target. In short, catnip for Coen fans. Energized by the ever-reliable cinematographer Roger Deakins’ slick colors, “Hail, Caesar!” follows Mannix through a series of outrageous conundrums surrounding his talent. While the real-life Mannix served as general manager for MGM, “Hail, Caesar!” positions him on a nondescript lot dealing with star troubles big and small. His series of challenges take the place of a cogent plot, which this kind of carefree movie doesn’t really need, anyway. There’s the relatively minor quibbles surrounding DeeAnna Moran (Scarlett Johansson), a pregnant actress coping with gas troubles in the middle of a spectacular “Footlight Parade”-like water number, and the goofy cowboy star Hobie Doyle (Alden Ehrenreich, underrated since his breakout role in Frances Ford Coppola’s “Twixt” and finally getting his due here), who struggles to tamp down his southern twang for a different kind of role. Pretty boy Burt Gurney, a song-and-dance man who’s a natural fit for Channing Tatum, may or may not harbor a nefarious agenda. Above all else, the Cold War setting provides Mannix with his biggest conspiratorial dilemma, when the buffoonish actor Baird Whitlock (George Clooney) winds up unwittingly kidnapped by Hollywood Communists in full Roman regalia in the midst of shooting a cheesy crucifixion movie. The Coens cycle through these interlocking incidents with mixed results, but unlike the cringe-worthy attempts at throwback comedy in their duds “Intolerable Cruelty” and “The Ladykillers,” the snappy energy of each scene holds the proceedings together. A peculiar exchange between Clooney’s Baird and his anti-capitalist kidnappers — among the naifs he’s played for the Coens over the years, this reigns supreme — drags on and on, but the Coens feel no need to rush ahead. A bizarre riff on the McCarthy-era paranoia of the time, the scenario plays out like Hollywood itself dreaming of its own weird myths. At the same time, these ingredients rarely congeal into a single vision. Random cameos from Jonah Hill and Frances McDormand are amusing enough, but don’t contribute enough to the world for their appearances to register as much more than cheeky asides. And even as it reaches for an outrageous Communist fantasy somewhere near its third act, “Hail, Caesar!” ultimately sizzles with an abrupt ending that suggests the Coens didn’t know where to stop. In a less exuberant version of this movie, that might make the whole enterprise lose its appeal. But the confidence of the Coens’ freewheeling collage sends a different message — that even a minor work from this pair can hit all their sweet spots. 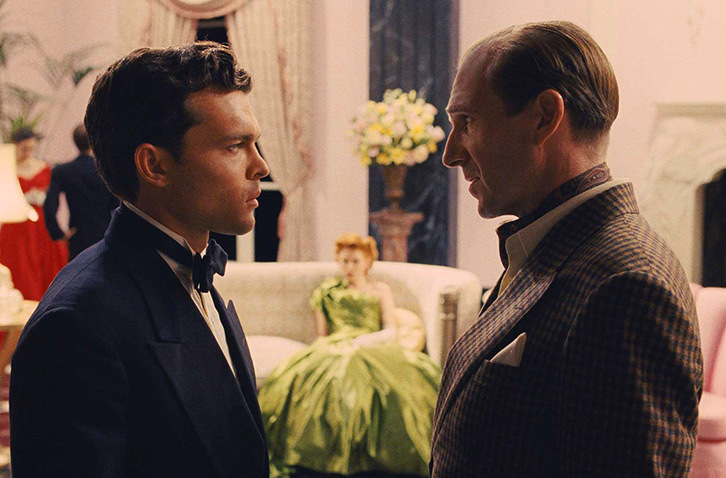 Despite its lightweight qualities, “Hail, Caesar!” is a genuinely entertaining commentary on the insular universe of the studio system, or at least the way it has been memorialized by the history books in larger-than-life proportions. The Coens get their cake and eat it, too: The lavish period details, paired with marvelous song-and-dance routines, work on their own terms while a firm self-awareness looms over every scene. It’s a tricky balance indicative of directors who know exactly what they’re going for: An old-fashioned homage to classic Hollywood and a send-up of the very same thing. “Hail, Caesar!” opens nationwide on February 5.